Located in Philadelphia, Pennsylvania, the Reading Terminal Market is one of the largest and oldest public markets in the United States and is listed as a National Historic Landmark, offering a variety of locally-sourced food and craft vendors. The history of public markets in Philadelphia dates back to the late 17th century, when the Jersey Market was established as part of city developer William Penn’s plans for organization of goods selling and distribution by local vendors and merchants to area citizens. Over the course of the 18th and early 19th centuries, the Jersey Market had expanded to occupy a six-block area along the eastern portion of what was known as High Street, located along the Delaware River. After the popularization of the streetcar, open-air markets began to fall out of favor in the United States, and in 1859, Philadelphia’s open-air markets were closed and replaced by two indoor markets, the Butchers’ and Farmers’ Market and the Franklin Market. The block the markets were contained on was purchased by the Philadelphia and Reading Railroad Company in 1890 for the purposes of constructing a railroad terminal, but due to merchants’ refusal to relocate, the establishment of a new market underneath the terminal’s train shed was proposed. In 1893, the new 78,000-square-foot Reading Terminal Market was opened to the public. By 1913, the Reading Terminal Market was home to more than 250 food dealers and 100 farmer vendors, noted as a major American market and offering advanced refrigeration technologies and delivery service as far away as Canada and Mexico. Throughout the Great Depression and World War II, the Market served as an important hub for regional food production in the face of national food and resource crises. Financial difficulties in the 1960s and 1970s led to the closure of the market’s central refrigeration system and the eventual closing of the Philadelphia and Reading Railroad Company in 1976, causing a general downturn in neighborhood business and economic activity, but during the latter part of the 20th century, the market experienced a revival after its purchase by the Pennsylvania Convention Center Authority. A nonprofit corporation for the operation of the market was established in 1995, reviving the Reading Terminal Market as a major center of business and commerce in downtown Philadelphia. Today, the Reading Terminal Market is one of the most popular public markets in the United States, attracting more than 100,000 visitors every week and making it the most-visited Philadelphia tourist attraction after the historic buildings and landmarks of Independence National Historical Park. Over 80 merchants are showcased at the market, including several operated by descendants of original historic market standholders. As a National Historic Landmark, the market retains much of its historic character, with original structures and technology updated to include a variety of modern amenities. A variety of fresh produce stands are offered at the market, including Iovine Brothers Produce, Kauffman’s Lancaster Country Produce, and the Fair Food Farmstand. High-quality local meats are offered by vendors such as Giunta’s Prime Shop, La Divisa Meats, and Martin’s Quality Meats and Sausages, while poultry is sold by Godshall’s Poultry and L. Halteman Family Country Foods. 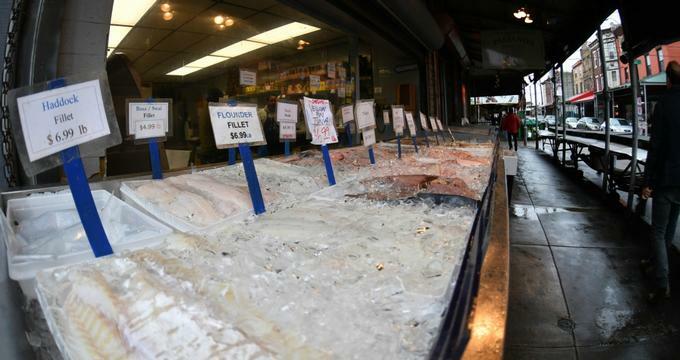 Several fresh seafood vendors are also offered, including the Golden Fish Market and the John Yi Fish Market, and fresh locally-produced cheese is sold by Downtown Cheese and the Riehl Deli & Cheese Shop. Gourmet imported groceries and snacks are offered at Jonathan Best Gourmet Grocer, while ethnic goods are sold at retailers such as Kamal’s Middle Eastern Specialties and the Little Thai Market. Fresh flowers and plants are also sold at the Market Blooms stand. A variety of international dining options are offered by stall vendors and sit-down establishments, including Mexican food at the 12th Street Cantina, Indian fare at Nanee’s Kitchen, traditional Pennsylvania Dutch cuisine at the Dutch Eating Place, Asian choices at Sang Kee Peking Duck and Shanghai Gourmet, and German offerings at Wursthaus Schmitz. Fresh breads, pastries, and desserts are offered at establishments such as the Metropolitan Bakery, Beiler’s Donuts and Salads, and Bassetts Ice Cream, while Old City Coffee and the Four Seasons Juice Bar offer beverage options. Several businesses also sell alcoholic beverages, such as the Molly Malloy’s traditional Irish pub and Blue Mountain Vineyards.Several businesses also offer alcoholic beverage options, such as the Molly Malloy’s traditional Irish pub. A number of sellers also offer handmade, local, and vintage housewares and goods, including Bee Natural, Contessa’s French Linens, and the Miscellanea Libri bookstore. Shopper services are provided for Reading Terminal Market customers, including curbside pickup and complimentary grocery bag storage. Cooking demonstrations, personalized Taste of Philadelphia chef-guided tours, and Tasting Thursdays sampling events are offered weekly or bi-weekly. Other special events include Book Nook Storytime events and Santa visits during the holiday season. A number of spaces within the market may also be rented for private special events.